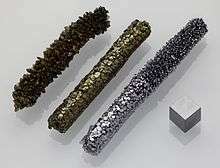 The lighter three Group 5 elements occur naturally and share similar properties; all three are hard refractory metals under standard conditions. The fourth element, dubnium, has been synthesized in laboratories, but it has not been found occurring in nature, with half-life of the most stable isotope, dubnium-268, being only 29 hours, and other isotopes even more radioactive. To date, no experiments in a supercollider have been conducted to synthesize the next member of the group, either unpentpentium (Upp) or unpentseptium (Ups). As unpentpentium and unpentseptium are both late period 8 elements it is unlikely that these elements will be synthesized in the near future. Dubnium was first produced in 1968 at the Joint Institute for Nuclear Research by bombarding americium-243 with neon-22. Dubnium was again produced at the Lawrence Berkeley Laboratory in 1970. The names "neilsbohrium" and "joliotium" were proposed for the element, but in 1997, the IUPAC decided to name the element dubnium. Vanadium, essential to ascidians and tunicates as vanabins, has been known in the blood cells of Ascidiacea (sea squirts) since 1911<ref name="henze1911" Henze (1911). Untersuchungen fiber das Blut der Ascidien. 1. Die Vanadiumbindung der Blutk6rperchen. Z. Physiol. Chem. 72, 494–50., in concentrations of vanadium in their blood more than 100 times higher than the concentration of vanadium in the seawater around them. Several species of macrofungi accumulate vanadium (up to 500 mg/kg in dry weight). Vanadium-dependent bromoperoxidase generates organobromine compounds in a number of species of marine algae. ↑ Holleman, Arnold F.; Wiberg, Egon; Wiberg, Nils (1985). Lehrbuch der Anorganischen Chemie (in German) (91–100 ed.). Walter de Gruyter. ISBN 3-11-007511-3. ↑ Hatchett, Charles (1802). "Eigenschaften und chemisches Verhalten des von Charlesw Hatchett entdeckten neuen Metalls, Columbium". Annalen der Physik (in German). 11 (5): 120–122. Bibcode:1802AnP....11..120H. doi:10.1002/andp.18020110507. 1 2 3 4 5 6 7 8 9 10 11 12 13 14 15 16 Emsley, John (2011). Nature's Building Blocks. ↑ Michibata H, Uyama T, Ueki T, Kanamori K (2002). "Vanadocytes, cells hold the key to resolving the highly selective accumulation and reduction of vanadium in ascidians". Microscopy Research and Technique. 56 (6): 421–434. doi:10.1002/jemt.10042. PMID 11921344. ↑ Kneifel, Helmut; Bayer, Ernst (1997). "Determination of the Structure of the Vanadium Compound, Amavadine, from Fly Agaric". Angewandte Chemie International Edition in English. 12 (6): 508. doi:10.1002/anie.197305081. ISSN 1521-3773. ↑ Badmaev, V.; Prakash, Subbalakshmi; Majeed, Muhammed (1999). "Vanadium: a review of its potential role in the fight against diabetes". Altern Complement Med. 5 (3): 273–291. doi:10.1089/acm.1999.5.273. PMID 10381252.